BIEN co-founder Philippe van Parijs and his former student and recurring coauthor Yannick Vanderborght have coauthored a major new work: Basic Income: A Radical Proposal for a Free Society and a Sane Economy, published in March 2017 by Harvard University Press. In the book, van Parijs and Vanderborght present a thorough history of basic income as well as a philosophical and practical defense. In the first chapter, they elaborate upon the concept of a basic income (“a regular income paid in cash to every individual member of a society, irrespective of income from other sources and with no strings attached”), explaining the significance of each of the key characteristics: it is paid in cash (rather than in kind), paid to individuals (rather than to households), universal, and obligation-free. In the second chapter they proceed to contrast basic income with alternative (but often closely related) proposals — such as the negative income tax (which is sometimes conflated with basic income), basic endowment, Earned Income Tax Credit, job guarantee, and working-time reduction. In the following two chapters, van Parijs and Vanderborght turn to the history of the idea of basic income, beginning in the sixteenth century with the writings of Thomas More and his fellow humanist Juan Luis Vives, then progressing alongside policy developments from England’s Poor Laws to the Speenhamland system to Bismarck’s social insurance to contemporary welfare states. The fourth chapter delves in more detail into the intellectual history of the idea, starting from Thomas Paine’s seminal proposal in Agrarian Justice and the competing proposal of his contemporary Thomas Spence. Van Parijs and Vanderborght relate the ideas of subsequent thinkers — including J.S. Mill, Bertrand Russell, George D.H. Cole (who coined the term ‘basic income’) — in their historical context. The authors describe the varied strands of support for minimum income proposals in the United States during the 1960s and early 1970s, briefly review the creation of Alaska’s Permanent Fund Dividend, and overview the emergence of the European movement in the 1970s and 1980s, including the founding of BIEN. 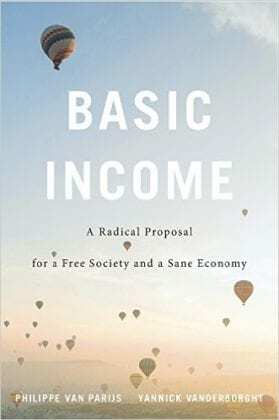 After this history, the authors devote a series of chapters to analyzing and rebutting arguments against basic income — the ethically based “free riding objection” to the lack of a work requirement, the practical concern that a basic income could not be sustainably funded, and the worry that basic income is not politically feasible. Finally, they devote a chapter to the impact of globalization on the implementation of a basic income. Basic Income has been featured as “Book of the week” by Times Higher Education, which published a review along with wide-ranging interviews with van Parijs and Vanderborght. There should have always been a basic income growing ever since the first society started. How do we overcome the portion of society that doesn’t want to share the wealth more evenly? Is it control freakery as well as a desperate greed that controls the nature of some, that hoarding instinct which grips us. Are we really unable to evolve above the instinct to hoard and truly rise above that which keeps humans at a primitive stage of our own evolution? We seem to be in a constant cycle of desperation to survive at the expense of others. Money is the root of all evil, tis like water or food and the comforts of our homes when there is shortage we fight for the scraps. We become so engrossed in our lives our everyday activity that we cannot see further than the end of our nose we have no time to try something new. It is such an obvious thing to create abundance so that we no longer have to worry about our stomachs being empty or having a nice place to live but we are struggling to make the transference from a society controlled by a divisive monetary system. We seem to be so close to creating this beautiful evolution in the human mindset but so far away from it, it is just that we are stuck in this cycle that the monetary system has created that it will take the actual implementation of Universal Basic Income to make people realise and begin to change the mindset that the monetary system has engrained in our brain cells for centuries. We need to reprogram our own brains to appreciate what actual abundance can do for the human race and then we will say wow why didn’t we do this centuries ago. We know the money to create an Unconditional Universal Basic Income is out there and creating this abundance is possible especially now we have the technology of BitCoin. Do some really fear all people becoming equal in abundance, do some really fear the loss of control over others? Money is the anthem of success, so people love to be extravagant because we get more love if we do…but if life becomes free to live, then i assume being greedy will fall into the category of taboo, as being impractical…because no-one would want to see how successful you are at living because its free to live anyway. From there i think people will start to focus on solving the problems of the world and people will be celebrated more for doing that instead of solving the problem of simply surviving and us celebrating those who succeed at living. Many people seem to not recognize the influence of system over personal grit in our individual circumstance. I predict Basic Income will become an economic necessity long before our baser nature can catch up. I’d love us to do it on the double-quick, and let our scarcity-snatchety sides drain out to the shadows while the Basic Income sun comes up on our better, more relaxed natures. At last a free lunch. I can actually have a good life without doing any work by this means. I wonder how many other people would prefer to follow me in this idea? If that picture is really you, you look like a retiree or at least should be. I myself am a retiree of less than a year. Looking back on these past months since retiring I discovered that I really have not stopped working, though I’m not doing what I once did. I rather suspect you might also be doing some kind of work. It might not be conventionally recognized but the concept of basic income does provide value to this un-remunerated effort. I don’t believe that most people would want to sit in a rocker or lounger all day long every day. I think most people would take some time to do something that helps someone else at some portion of their time. Most people want to “belong” and any effort to serve another or others helps satisfy that desire. A good start in that direction might be to make the minimum Social Security payout at least equal to the official poverty line, currently about $1,000/month. Many seniors receive less and tend to rely on food stamps and other social services to get by. Less dependence on those agencies would lower their costs and offset the SS increase to some degree. It is interesting reading many arguments for a basic income that it will result in a more equal society. Exactly how will that occur? There will always be people who are motivated by material success and there is nothing per se wrong with that. I believe that rather than there being a universal basic income for all in any one country, there should be a standard basis income for all adults upto a threshold income because the aim is to lift people out to poverty not to give everybody a free lunch.